When I first started down the road of "how do I make sure my grading system supports learning and is not just a tool for communication" I found my biggest challenge was not creating lessons or building proficiency scales, it wasn't student buy-in or parent buy-in, it wasn't admin support or all the things you would think would stand in the way of such a foundational shift in practices. No, it was something entirely out of my control, the biggest challenge was trying to figure out how to get the digital grade book I had to use per my contract to play nice with a 0-4 scale. The 100 point scale is a dream killer and it is full of opportunities for our own bias to trickle into the grading process. Maybe Johnny and Sally did the same level of mastery but Johnny had an attitude when completing it, how likely is it that Sally will get an 85% and Johnny will get an 80% while those few points might seem like nothing, that can add up. The bias that can find it's way into 100 point scales is just one reason to abandon it. Another is to consider are there really 100 different levels or mastery or achievement for that particular task or skill? Is the difference between an 80 and an 83 really 3 degrees of mastery or proficiency? If it isn't, why are there so many points you could award for the task at hand? Add to that the fact that a 0-4 scale allows for great inter-reliability between teachers. And then there is the role of a 0 on a 100 point scale where it acts as a dream killer and grade destroyer. It takes, on average, 8 assignments to make up for the impact of a single 0 on a 100 point scale so why would a kid even keep trying when all they can see is the hole they are in and no way out? Now, this post today isn't really supposed to be about the reasons to go with a 0-4 scale, if you want to learn more I suggest looking here and here. Instead, I want to focus on trying to make this shift when you are stuck with a traditional grade reporting system that ONLY reads 100 point scales. 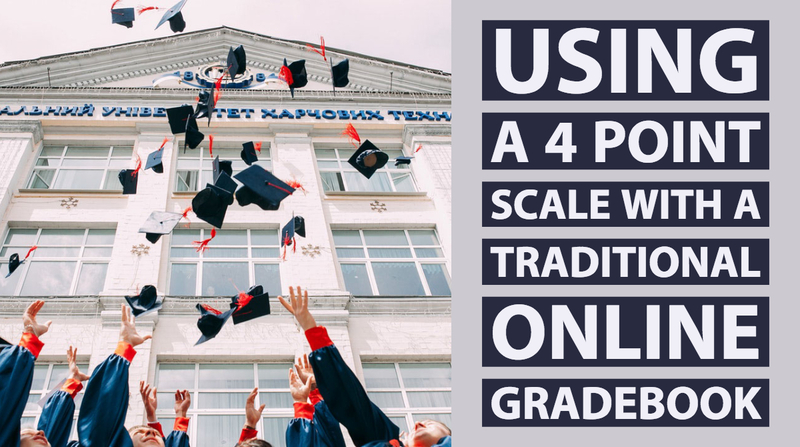 The first thing you have to do when you convert your class to a 0-4 scale is you have to take time to determine what each level of the scale will mean for each assignment or task you give. 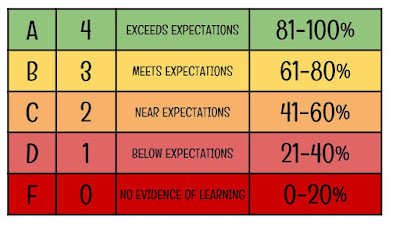 I always talk to teachers about developing their rubrics and ranges first because this is where the actual scoring and grading happens. This is where you as the teacher (hopefully with a PLC group) determine what mastery looks like. And this is where your traditional scales don't always need to be changed that much, what you considered an A before can probably stay an A or a 4, what you considered an F before can probably stay an F or a 0. The purpose is not to make the rigor or expectations lower, the purpose is to make the system of measure more equitable and accessible. 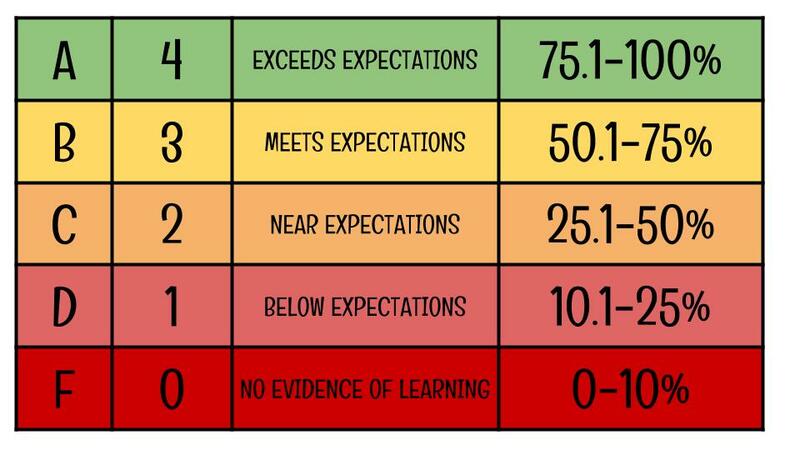 Even though the above is acceptable as a way to make the shift it is still absolutely worth it to take the time and go through your rubrics and ranges with your PLC to determine if the scales you've been using truly reflect what you are trying to measure. 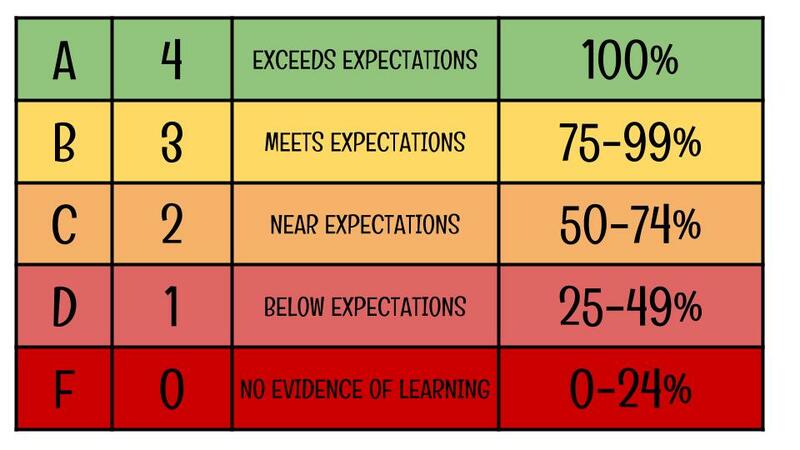 And if you are going Standards-Based (which is what I actually do in my classroom) then you REALLY need to have conversations on what a 4 is for each standard you plan to measure throughout the year, that's a process that you can read about in more depth here, here, and here. 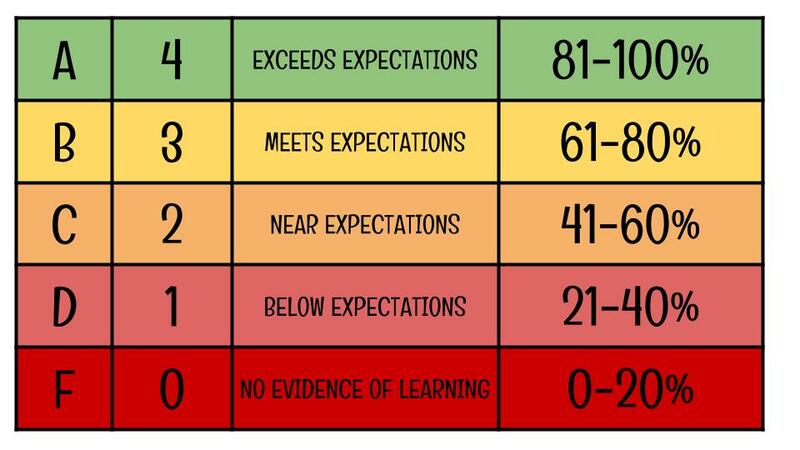 When I first started exploring grade reform practices I started with just this, moving to a 0-4 scale with weighted categories but when I went to input grades into Aequitas (our grade reporting system for our district) I had to hack it to get it to read the grades the way I wanted it to. You see Aequitas can only read grades out of 100% scale and the default scale is the one we have all taught with at some point. But when using that default scale if you enter a 2 for a grade (which on a 0-4 scale should be the equivalent of a C) then the computer system then assigns them a 50% which is an F. Since Aequitas only offers the ability to average scores on a 100% scale I had to hack the back end scale and adjust it so it would always read that a 4 = A, a 3 = B, and 2 = C, and a 1 = D. It is messy and imperfect and I don't feel totally comfortable with it but I still feel MORE comfortable and confident with the messy imperfect hack than the traditional dream killing way I had been reporting grades before. 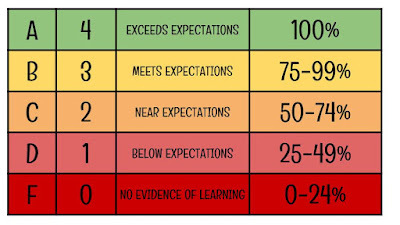 Now, remember, this is NOT the scale I would apply to individual assessments or tasks. This is just what I do to the grade reporting systems overall scale so it will read individual task grades accurately and you actually have some options on how to approach this hack. Option 1 - an A in your class means exceeding expectations on every. single. task. If you choose this one, A's become incredibly rare. I don't personally use this one but it could absolutely hack the grade book to make this level of rigor a requirement. To me, it seems at odds with my views on learning but that doesn't mean there aren't scenarios in which it would work. For the most part, there range between each letter grade is equal distance with the exception of an F which is anyone with a total below 10%. 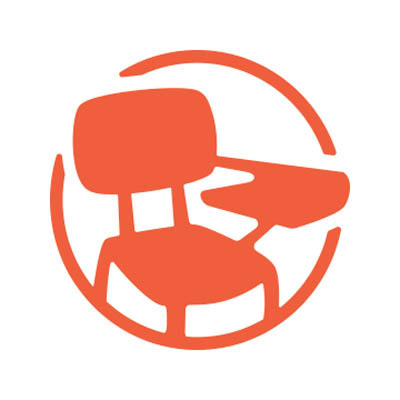 This system reads that a 3 = B and a 2 = C but it will also move a student to the letter grade above if they start to average anything above a 3 or above a 2. Because I am standards-based, this is ideal for me (well kind of, averaging, in general, is not ideal but that's a post for another day.) Each task in the grade book is a standard, not an assignment not a worksheet not an essay and so if they are averaging above a 3 I am comfortable with them earning an A. Does this make it a little easier to move from a B to an A with just a few tasks averaging above a B, absolutely it does but this is what I feel most comfortable with it because as students see themselves progressing forward they are more likely to try again and resubmit. 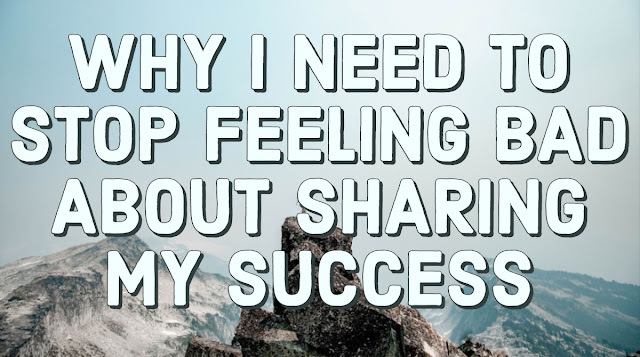 My goal is to get students inspired to keep trying and so I need them to be able to easily see what that looks like. 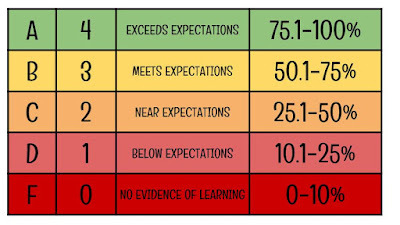 When I tried the scale below, it did not work as well for me and my goals but again, this is because my grade book is only standards, if you were using a grade book of only more traditional tasks and weighted categories Option 3 might be more ideal for you. 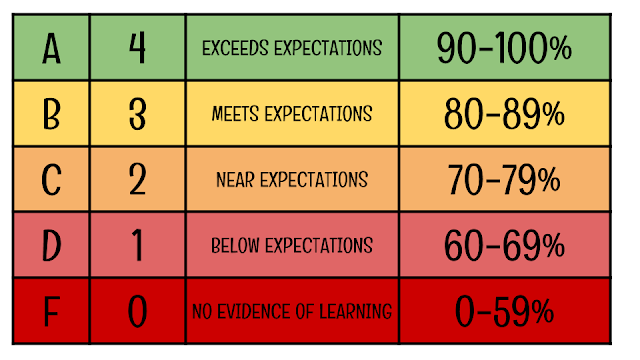 Every letter grade is the equal distance on the scale and a 3 still equals a B and a 2 still equals a C but now students have to average a little higher to move from one grade to the next. This one works really well with a classroom that is traditional in every other way except the use of a 0-4 scale. It could work in an SBG class as well but for me, it wasn't ideal for my classroom it didn't help me with my goals of growth as well as the scale I currently use but that doesn't mean you couldn't successfully use it. The important thing to remember when looking through the three main options is that these are all hacks to the system that does not lend itself to grade reform. None of these are truly ideal, if I could have it my way with my SBG classroom that 100 point scale would disappear forever but I have a contract I follow and a grade reporting system I am required to use so I've done what I can to make the most within the limitations I must work in. As I said before, the biggest challenge has been finding the best ways to hack a system that doesn't align with grade reform at all. There isn't a perfect way to make this work. The perfect way would be the ability to use alternative grade reporting systems that allow us to think past median scoring but that's just not where we are at yet so I've tried to do the best I can with the systems that are in place. And what is important to remember is that grade reform is not about making it easier for students to pass or do well. You aren't changing your scale to make your class easier. It is true that I have less F's than ever before but I also have significantly fewer A's. Grade Reform practices are never about making it easier, they are about making it more accurate. I appreciate you sharing this information with me. I've only been exposed to this idea at the Literacy Conference and the the Grading conference we attended together. I hope more opportunities to learn will be available because this information is exciting, realistic, and logical! I had some experience in LAUSD, but that was many moons ago; and I'm glad to be back in the mix. Best regards to you! Can you show or explain an example of how you assess a student's ability to demonstrate the standard? You wrote that grades in the gradebook are not essays or assignments so I'm curious what your method is. Thank you for your time!